Take this medication by mouth as directed by your doctor, within 1 hour of finishing a meal, usually once a day. The dosage is based on your medical condition and response to treatment. Tell your doctor right away if any of these rare but seriousdark urine, persistent nausea or vomiting, stomach/abdominal pain, yellowing eyes or skin, easy bruising or bleeding, new/worsening sore throat, new/worsening fever. List Amoxicillin ER side effects by likelihood and severity. Does Amoxicillin ER interact with other medications? 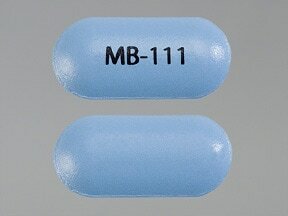 This medicine is a blue, oval, film-coated, tablet imprinted with "MB-111". Are you taking Amoxicillin ER? Are you considering switching to Amoxicillin ER? How long have you been taking Amoxicillin ER?